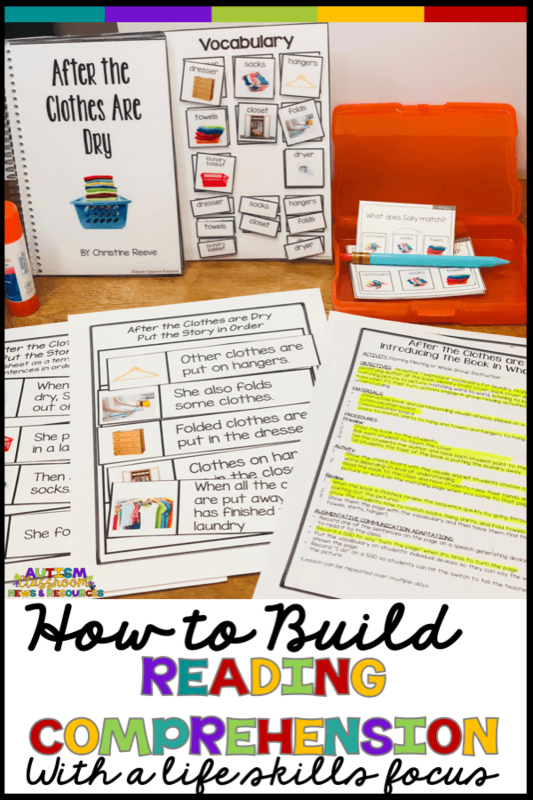 If you are a life skills teacher, you know how difficult it is to find real-life materials that you can use to teach meaningful literacy and reading comprehension to your students. It’s particularly difficult when you get to the middle and high school level and so many of the curricula are designed for young kids. I started creating the Life Skills Interactive Book units as a way to address both learning about life skills and practicing reading. And they have included methods of assessing and teaching reading comprehension along the way. I talked about how you can use them in this post. Today I want to show you the latest unit and everything it contains to make your life easier. The latest unit focuses on doing the laundry. I chose this because not only is this a skill students need to learn. It also allows adding easy sequencing tasks to be able to tell the story. The heart of this unit are the interactive or adapted books. I’ve talked about ways you can use interactive books for literacy, for a variety of functions and activities, receptive language, and for augmentative communication in the past. The life skills interactive books are all set up with photos. As with all my interactive books, the students can match both pictures and/ or words. And there is a combination of nouns and verbs among the books. There are 5 interactive books in the set. Ways to Do Laundry focuses on ways clothes get clean (e.g., dry cleaning, laundromat, washer, dryer). Doing Laundry is an overview of the laundry process, washing and drying. Washing the Clothes, Drying the Clothes, and After the Clothes are Clean follow the sequence for each part of the chore for Sally. Washing starts with gathering the laundry through starting the wash. Drying takes the laundry from the washer to the clothesline or the dryer. And After includes folding and putting the clothes away. There are lesson plans included to show how you can use them. The plans are designed to allow you to easily place the objectives and procedures into your own lesson plans. Or simply attach the lesson plan (highlighting the goals and procedures you want used) to your plans and give it to other staff who will be running the activity. Each book has 8 lesson plans for it--4 focused on whole group activities and 4 focused on direct instruction or small group. Each lesson plan has a sequence of instruction with steps to follow to include lessons over different days. Group activity lesson plans have suggestions for ways to include augmentative communication in the activities. The direct instruction plans include ways to implement the activities in small groups as well. Paste the pages in a file folder and have students sequence or match sentences to pictures or sentences to sentences. Each book comes with a set of task cards (44 task cards in all) focused on answering questions about the text. Most answers come directly from the text, but some require more interpretation than rote information. Task cards come with picture choices or just text. This way you can differentiate for different needs of your learners. This set of activities is perfect for life skills classrooms, secondary self-contained classrooms, students who are non-readers, group activities for students with different levels of needs, and teaching comprehension and vocabulary. The set also comes with suggested extension activities and sample IEP goals. Want to know more? Click below!